Physics – Dare to be Wise and be Curious about the Wonderful Universe around us! Physics is the most fundamental of the experimental sciences, as it seeks to explain the universe itself from the very smallest particles to the vast distances between galaxies. The Physics Department at TBGS is characterised by enthusiasm for science in general, a fascination for Physics in particular, coupled with a commitment to high quality and effective teaching. Our aim is for that teaching to bring about deep learning for all students and to develop a curiosity about the world and universe that they will carry with them for the rest of their lives. The skills that students studying Physics gain at TBGS (practical, problem solving, numeracy, analysis, team work, communication and research) equips them to be able to enter a wide range of professions, not just in Physics and Engineering, but in Finance and Journalism, for example. Students studying Physics at TBGS do so through a Themed Course each year. This gives students a real life context in which to apply the concepts they are learning, and encourages a wider synoptic view of the subject rather than simply learning topic titles. 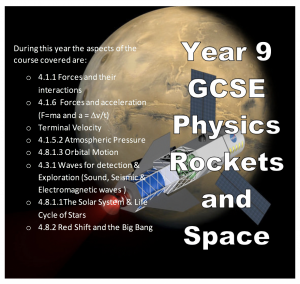 Year 9 Rockets and Space. During the year students study how rockets are put into space, the types of orbits satellites occupy and the reasons for doing so. Later on we look to see how Waves are used for Communication and Exploration, and investigate issues about colonising other planets before a final look at the life-cycle of stars, and evidence for the Big Bang and the evolution of the Universe. At the end of Year 9, students are assessed as to which course best suits them, Physics or Trilogy based on teacher judgement as well as tests and homework tasks throughout the year. They then follow their course throughout Year 10 and 11. 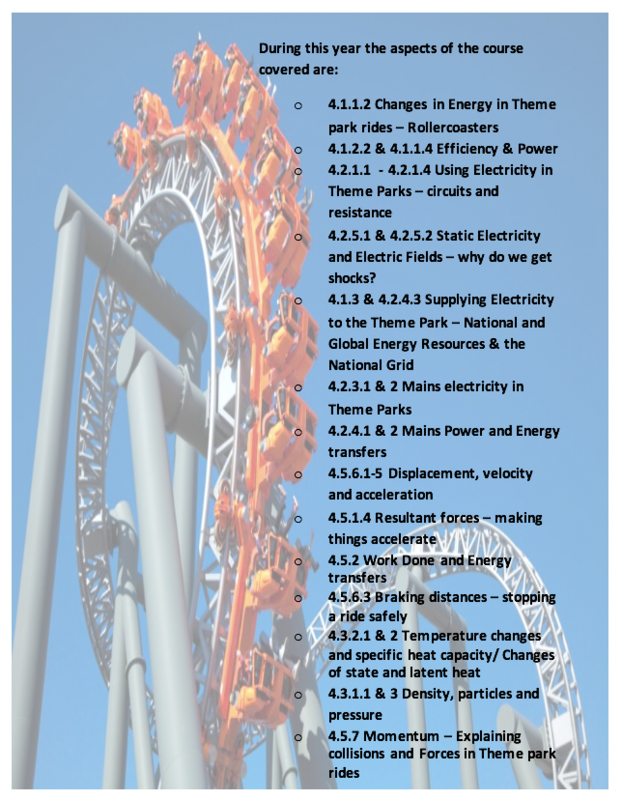 During this year, students study the Physics of Theme Parks, all the way from Forces and Energy in Rollercoaster, through to powering the Parks and how Electricity is used in the different aspects of the Park. 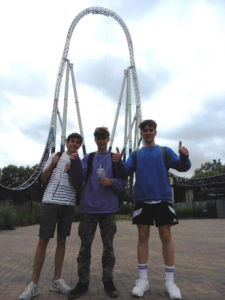 The Year culminates with a visit to Thorpe Park, during which students have the opportunity to explore the Physics they have been learning first hand. Those students studying The Physics content of the Trilogy course continue to study other aspects of Theme Parks such as floating & sinking, collisions and the construction of electrical motors in the Park. 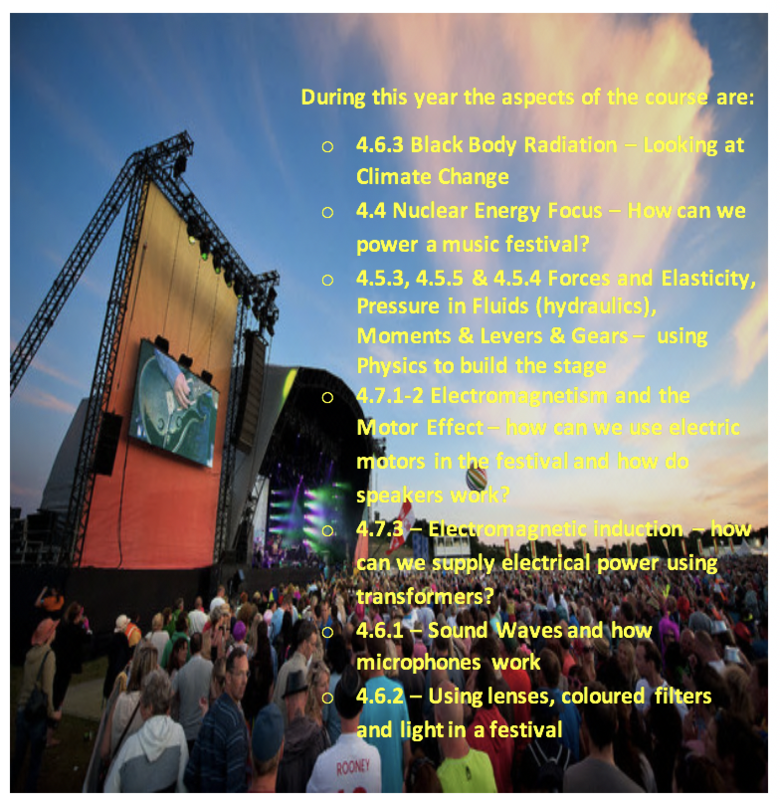 Those studying the separate Physics GCSE study the Physics of Music Festivals. This includes considering the effects of climate change on choosing the location of a festival, the construction of loudspeakers and microphones, and exploring how coloured filters and lenses are used for stage lighting. Although Year 11 students will have finished school at this time, the TBGS End of Term Music Festival (Torcella) provides an extremely local context for this course!! At TBGS, ‘Physics theory and experiments are undertaken by all students. They complement one another naturally, as they do in the wider scientific community. The Diploma Programme physics course allows students to develop traditional practical skills and techniques and increase their abilities in the use of mathematics, which is the language of physics. It also allows students to develop interpersonal and digital communication skills which are essential in modern scientific endeavour and are important life-enhancing, transferable skills in their own right. The Diploma Programme physics course includes the essential principles of the subject but also, through selection of an option, allows us some flexibility to tailor the course to meet the needs of our students. The course is available at both SL and HL, and therefore accommodates students who wish to study physics as their major subject in higher education (e.g. University) and those who do not. Students are invited from across the Year groups to participate in these challenging written papers, some of which are used to select students to be part of the UK team in the International Competition. 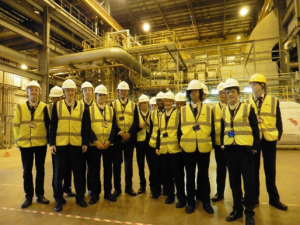 It is important that students learn about the application of Physics in careers and everyday life, and the Physics department run trips throughout the year to complement the courses. As mentioned before, this included Thorpe Park for Year 10, but in the past trip shave been run to the Langage Energy Centre near Plymouth, Gooch and Housego Fibre Optics in Torquay, Science Live in London (residential), the Joint European Torus (JET) in Oxfordshire. Each Year TBGS hosts an annual Science Fair that allows the IB students to carry out their Group 4 Project, and interdisciplinary project where students work from each of the 3 sciences to explore a particular topic area to present. It also allows students from all years to get together in teams to showcase science projects and experiments that they would not otherwise do at school. We always have a great range of exhibits, including hovercraft, bubbles, explosions, static electricity, as well as local engineering companies who allow visitors to see where interest in STEM subjects can lead. 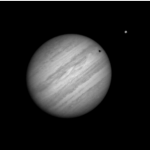 In 2014 the school, alongside donations from the Torbay Astronomical Society, (TAS) and Spirent Communications, purchased a Celestron C1400 EdgeHD, a Schmidt Cassegrain Telescope (SCT), combined with a high definition optical system for wide field, astrograph quality images. This is coupled with an EQ8 mount with full GOTO facilities allowing celestial objects of interest be to located with ease. It is housed in a purpose built observatory next to the Physics department. 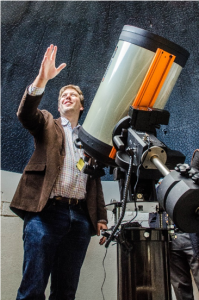 It was in the same observatory that Professor Chris Lintott started his interest in Astronomy. As of 2017 he is co-director of the Programme on Computational Cosmology and Citizen Science Project Lead in the Department of Physics at the University of Oxford, but is best known as the primary presenter on the BBC’s Sky at Night programme. 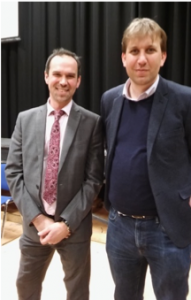 Professor Lintott is the Patron of the Torbay Astronomical Society (TAS) and gives the annual Hedley Robinson Memorial Lecture in the Cavanna Centenary Hall at the school, which members of the general public are welcome to attend.